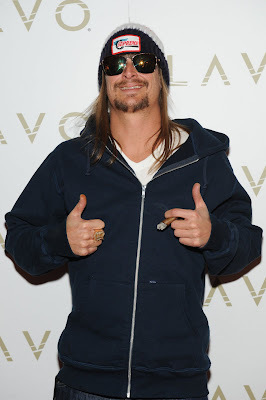 Kid Rock aka Bob Ritchie celebrated his 39th birthday in true Vegas style Sunday night at LAVO . The rocker gathered a crew of friends and flew in Sunday evening, with only one request upon landing… In n Out Burger, please! After getting the snacks delivered to his room he washed it down with some beverages and listened to some music in his Palazzo Penthouse suite. After a few hours of pre-partying he made his way down to the red carpet… people all through the casino were screaming happy birthday and he bashfully waved and said thank you to all. He stopped on the carpet and posed with his trusty bottle of Jim Beam that he had stashed in his back pocket. After red carpet duties complete he made his way to LAVO private dining room where he and his friends feasted on LAVO’s Italian fare. A gold birthday cake emblazoned with an Old English style “D” across the front to represent his home town of Detroit was presented and everyone had a bit before making their way to the club. 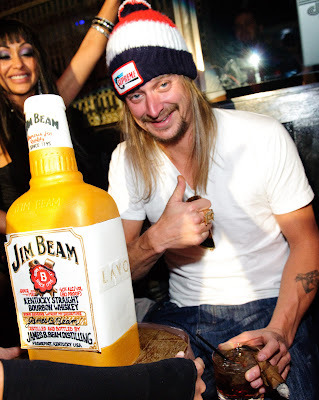 DJ VICE started up a rock set upon Kid Rock’s arrival at his VIP table on the dance floor in front of the DJ booth, then VICE led the room in wishing the rocker a happy birthday as a giant cake – a 2 foot tall exact replica of a Jim Beam bottle was delivered to his table.